Eat, drink, and play at Dave & Buster's Fair Oaks Mall grand opening. Remember the days when you had to trek all the way to Maryland to find a Dave & Buster's, or deal with Springfield Mall’s crazy parking situation just to get to your favorite adult arcade? Well, those days are over. Starting March 25, you can eat, drink, play, and watch sports right in the city of Fairfax. Family-friendly entertainment restaurant Dave & Buster’s is bringing its fun times to Fairfax and opening a new center right in the Fair Oaks Mall. Located at 11958 U Fair Oaks Shopping Center, this Dave & Busters will take the spot of the old Sears store and will provide hours of fun for everyone in the area. The grand opening of the new Dave & Buster's is set for Monday, March 25, from 11 a.m. to midnight. So, invite your friends, put on your game face, and get ready to stomp out the competition. $5 bar bites: Asian chicken wonton nachos, Mexican street corn quesadillas, Bavarian pretzels, loaded pot stickers, and guacamole and chips. 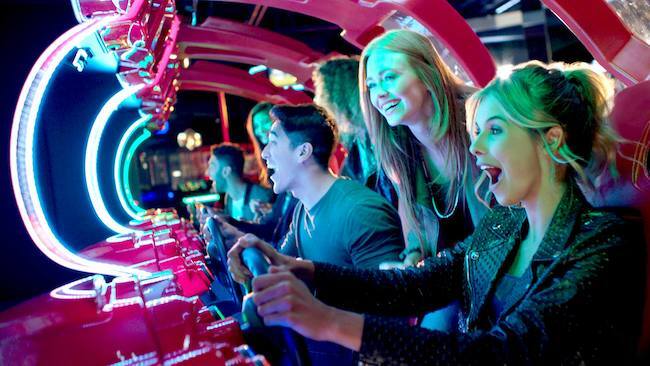 Newcomers to the world of Dave & Buster’s can also sign up for Dave & Buster’s Rewards to get $10 worth of free gameplay with a $10 game play purchase. Once you register your Power Card, you can also earn $10 for every $100 you spend on food, drinks, and games. Make plans today to attend the Fairfax Dave & Buster’s grand opening on March 25 and welcome them to the neighborhood! Capitol Hill is getting its own Steak 'n Shake. Read all about it here!